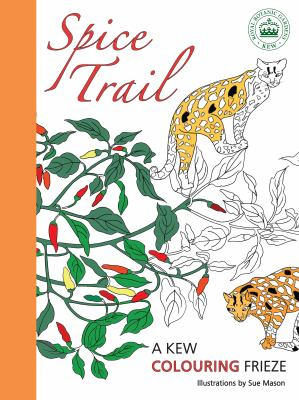 Spice Trail : A Kew Colouring Frieze - ubiq bookshop: the best place to buy books! Spice Trail takes you around the globe with black and white line drawings of spice plants accompanied by native animals, all interconnected to create a pull out frieze, to put up on your wall or keep in the book. With exotic scenes including sesame and elephants, cinnamon and tigers, and cardamom and peacocks, these delightful illustrations for colouring in are ideal for all ages, as a fun, relaxing and creative activity. With no guides on colour, the resulting artwork is up to you! Sue Mason is an illustrator whose art is inspired by the patterns in nature that she has discovered at the Royal Botanic Gardens, Kew.